“The “Anti Monopoly Amendment,” also known as Issue 2, has been misrepresented and its true intent has been obscured by speculation. It’s true purpose lost through miseducation & sometimes mal-intent. As someone who was very close to its creation, I would like to address the concerns regarding Issue 2’s impact on Legalize Ohio 2016’s proposal, The Cannabis Control Amendment and future initiatives (Marijuana or not). This issue of investor-driven business plans in the form of proposed amendments to state constitutions began getting attention in the Statehouse in the summer of 2013. Bipartisan concern over this trend is reflected in the minutes of the Aug. 8, 2013 meeting of the Constitutional Revision and Updating Committee of the Ohio Constitutional Modernization Commission. Members expressed concern over the need to protect the interests of the people from wealthy special interests who would use the initiative process to carve exclusive economic benefits for themselves in the state constitution. This was fully 18 months before anyone at the Statehouse had heard of Responsible Ohio. Issue 2 gives Ohioans the opportunity to say that the Ohio Constitution should not be the place for market opportunities — and market exclusives — for private business plans seeking to maximize return on investment. Responsible Ohio proponents like to argue that Issue 2 affects LegalizeOhio2016 because the Cannabis Control Amendment (CCA) “specifies or determines a tax rate.” They’re wrong, and I will tell you why. How the amendment actually reads regarding tax provisions. From the PDF of final language as adopted by legislature. Section B(1) only applies to tax provisions that create a preferential tax rate for one group of people and not others in the same class. The words “specify or determine a tax rate” are not properly read as a standalone clause. Rather, they should be read in the context of the Section as a whole. Several attorneys and tax professionals have been reviewing our amendment for weeks and are unable to determine specifically how our tax rate is preferential. This is because the amendment was not written to provide a preferential tax rate. This is further proof that Issue 2 does not affect citizen’s initiatives that do not grant special economic rights to one group of people and not others. The intent of the legislature is clear: to make it more difficult for wealthy special interests to subvert the ballot initiative process by using it to endow themselves with special economic rights, including preferential tax rates (setting themselves to zero, for example, as Issue 3 does. http://bit.ly/1L0EALJ) into the constitution. “Legalization of pot is a fine thing,” if the voters want it, Yost told our statehouse reporter Laura Bischoff back in May before the introduction of Issue 2. There is nothing in the amendment that prohibits the legalization of marijuana by voter initiative down the line. 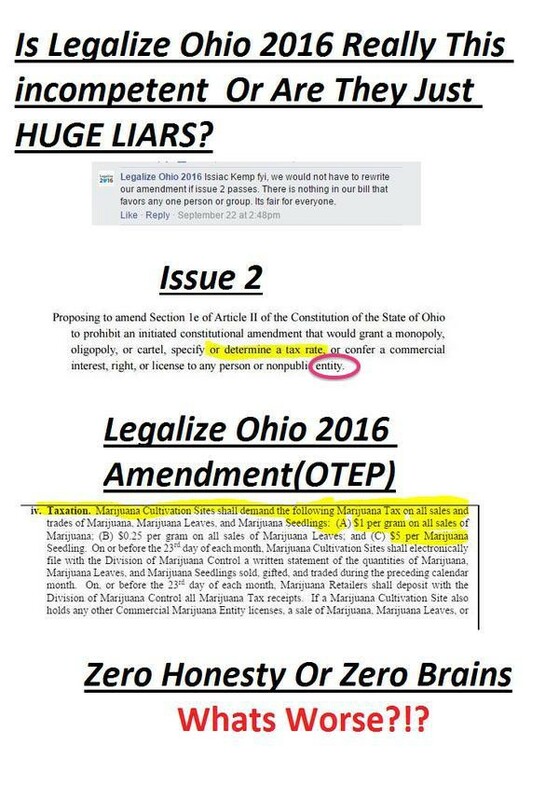 Even IF Issue 2 affected Legalize Ohio 2016, the worst case scenario would be two ballot questions. One regarding approving the tax provision, the other the amendment. It certainly wouldn’t nullify us. Most of the critics say they talk to “constitutional experts” but can’t (won’t) name who they talk to. We would nevertheless challenge it in court. Finding legal representation won’t be a problem, and we are confident we would win. The Ballot Board does it’s Issue 2 review upon the first submission, when the ballot board determines whether its a single issue. You don’t have to go get all the signatures first, Secretary Husted and others have said so publicly. The Ohio Rights Group falsely claims otherwise in this article: (http://bit.ly/1QJxHOR). Putting a constitutional amendment on the ballot in Ohio is hard work. It takes dedicated volunteers, all kinds of resources, a ton of community organizing, and a rock solid base of support. It takes more than money and nothing in Issue 2 makes this process more difficult than it already is. The idea that only “for profit investors” would finance citizens initiatives (or legalization) is ridiculous. Not one marijuana campaign so far has been financed solely by “investors.” Constitutional amendments are not business plans. Nothing in Issue 2 makes this process more difficult than it already is. That’s not at all what Issue 2 says. It only addresses amendments on the 2015 ballot that create a monopoly, oligopoly, or cartel for the sale, distribution, or other use of any federal Schedule I controlled substance. In other words, those provisions only apply to Responsible Ohio. Only in November 2015. From PDF of final language. Is this dirty and underhanded by the legislature? Probably, but I think funneling millions of dollars anonymously through corporations to buy exclusive rights to grow marijuana into the Constitution is pretty underhanded too. Their investors are already talking about 2016, and 2017 if Issue 3 fails this year. The idea this is Ohio’s only chance is even more ridiculous. The idea that the legislature will be able to pass something to nullify true legalization (like the CCA) during a presidential election year is ridiculous. Too many politicians would face the backlash from their constituents in a year most of them are running for reelection. Furthermore, many Ohio legislators aren’t necessarily opposed to legalization; they are simply opposed to this particular attempt to enshrine a marijuana monopoly in the Constitution. Why is Issue 2 important? When I first started discussing Responsible Ohio with my colleagues in California, the first question out of everyone’s mouth was “How is this legal?” Absurd as it may be, it’s legal because Ohio hasn’t yet done anything to prevent it. Nineteen other states already have anti-monopoly provisions to prevent situations like this. It’s time for Ohio to make it twenty. Issue 2 prevents other Constitutional shenanigans, as well. There have been various attempts at establishing exclusive financial interests as well. For example, the “Ohio Clean Energy Initiative” requires the State to issue $1.3 Billion in bonds to fund Ohio Energy Initiative Commission LLC, a Delaware registered corporation, with no oversight. Issue 2 will prevent something like that from ever being proposed again, without the voters knowing exactly what they are voting on. Which is allowing the constitution to be amended while giving an economic advantage to a specific group of people, not available to other similarly situated individuals. Issue 2 is good public policy. It protects the constitution, plain and simple. A yes vote on Issue 2 means schemes like Responsible Ohio and the Clean Energy Initiative go away and, most importantly, NEVER come back. Vote Yes on Issue 2.